Known by many names (Architecture Proposals, RFCs, Design Documents, Architecture Review docs, Architecture Design Records…), these all have the same objective: to present your thoughts to a wider audience, to solicit feedback, and to persuade decision makers. I’ve come to realise that their success depends heavily on how they are delivered, regardless of how good the proposal is. The reality is that being “right” often isn’t actually enough: even the most compelling and logical argument can be ruined by poor communication. To see your work lose its impact because of non-technical reasons is incredibly frustrating! In this article I’ll share some of the lessons I’ve learned along the way on how to ensure that it’s the content that does all the talking. Firstly, let’s clarify what we mean by an Architecture Proposal. These documents are typically only written for significant architecture decisions or adoption of new technologies. Topics which could merit an architecture proposal might include “migrating to TypeScript” or “replacing our REST endpoints with GraphQL”. It’s not guaranteed that an organisation will value these proposals, but they’re beneficial in a lot of ways. As well as being useful as a way to organise your own thoughts, they increase transparency throughout an organisation and a library of these documents enables new engineers to learn the context and thought process around how systems are architected. Needing to include this context in the message is a clear signal that your document is missing context and needs revisiting. The reason why this is so important is because the proposal is almost certainly going to be passed onto others who don’t have this additional context and this could entirely change the way they perceive it. Put that context in the first paragraph! If a proposal is interesting, and especially if it’s controversial, then people will share it further than you ever expect. Don’t expect to be able to tweak and refine it before it reaches that person. And don’t expect access rights to fix this! People will read it over each others’ shoulders. Instead, accept that you can’t contain it and make sure that the premise and goals of your proposal are accessible to everyone. If there’s a certain person or department that you think might be resistant to the changes you’re proposing then make sure you explicitly call out their concerns in the document and proactively share it with them. Maybe you can’t contain a document’s reach once it’s “public public” but you should certainly be able to within your closest group of colleagues. This step is important for catching any obvious issues and making sure that the proposal is technically sound. I like to think of it like code review: an opportunity to find bugs before it gets to production. This group should be made up of people whose critical abilities you trust, and who you can expect to get honest and direct feedback from. Try to ensure it’s not made up entirely of Yes People. If you’re only getting positive feedback then push them to be harder on you! Non-goals are not a way of you opting out of responsibility though. Let’s say you’re writing a proposal to migrate all of your front end applications to React, a valid non-goal might be “This proposal does not aim to set coding standards for how we will write application code using React”. These standards can be figured out later if you decide to take forward the proposal so they’re not worth including as part of the core argument. An invalid non-goal might be “This proposal does not consider the impact on SEO”. In this case, presuming your site is public, being “SEO-friendly” is likely to be a constraint in your decision. Given that you can’t control how far the proposal will reach you should anticipate that it will be read by people who are outside your technical domain: product managers, designers, your CEO even; as well as people who don’t have the same native language as you. Where possible use language that can be understood by anyone. Be succinct and to the point, and skip any big words that don’t add value to the sentence. Avoid talking too much in the abstract; people are reading to get the specifics of your proposal. You should aim to gear the language of sections towards their intended audience. Avoid using technical language in the introductory sections unless it’s otherwise impossible to convey your point. When you are in the purely technical sections you can use technical language unapologetically. If you think there’s any risk that certain concepts are familiar to only a small minority then link out to further reading on the subject. I’ve definitely made more mistakes than the ones above but I may unfortunately have scrubbed them from my memory. Regardless, if you follow these you’ll be a step ahead of where I was. Remember that your number one goal is to connect your ideas with other people, so always keep your audience in mind and write the docs for them, not for yourself. Worth a Watch is a site of mine that tells me which NBA games are worth watching from the night before: a vital service for any europe-based basketball fan! Last summer I wanted to work on the site with a couple of friends but the logic to build and deploy it was impossible to share and explain. It needed a rebuild and doing so gave me an opportunity to lean more heavily into some of the modern tooling that’s now available. These are the steps I took along the way. 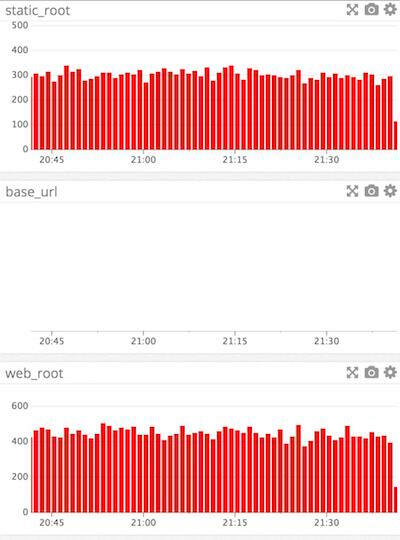 If you haven’t heard of Netlify it’s a platform for serving static sites. There are a lot of optimisations going on under the hood to make it efficient at doing this but what really makes it stand out is how user friendly it is. Within minutes you can be up and running with a full continuous integration and deployment pipeline for your site. That means no more copy and pasting CLI commands! It took about an hour from opening an account to having something set up, and most of that time was spent trying to understand how to update the DNS on my domain name. I was able to configure deployments and give team members access rights so they could make changes and see them reflected on the site within seconds - way better than what I had before! The good part about my previous implementation was it required zero network requests and was very lightweight. The bad part was everything else. It’s a very simple UI but even so I wanted to write it in (p)react just because it’s so pleasant to use. I chose Preact over React purely because it was lighter. One thing I definitely didn’t want to manage was an elaborate build process. All I wanted was to be able to compile JS and CSS and serve it in an optimised format. So I picked up Preact-CLI which is a zero config build tool with all the right optimizations and server rendering built in. I could write modern JS, use CSS modules and drop in whatever other static assets I needed, Preact-CLI would serve them up statically or via a hot-reloading dev server. It worked really nicely out of the box. The only thing I opted out of here was service workers. It’s something I wanted to have total control of - partly because their power scares me and partly because it was a good opportunity to learn how they work myself. I added this functionality much later on. Netlify can also host and deploy lambda functions for you so this was an obvious choice for me because I could manage everything in one place. I decided to split the previous lambda function in two and have the part hosted on netlify only speak to a database rather than the third party API (due to rate limit reasons). I’d get the scores into the database another way later. Netlify has a nice UI where you can add environment variables so that your secrets don’t need to be in the code themselves. I added my AWS credentials there so that netlify could speak to dynamoDB. As soon as I had done this all my builds started crashing with a deploy error. I’d changed quite a few things so it wasn’t immediately obvious that it was due to the env variables. Eventually I realised that adding my credentials as AWS_ACCESS_KEY_ID and AWS_SECRET_ACCESS_KEY actually caused Netlify’s own credentials to be overwritten. Yeahhh :/ I prefixed them with MY_ and everything started to work nicely again. That was the “Site” work fully done: it worked well and was easy to manage. I then had to build the other side of the architecture (the import workflow) responsible for importing the scores. 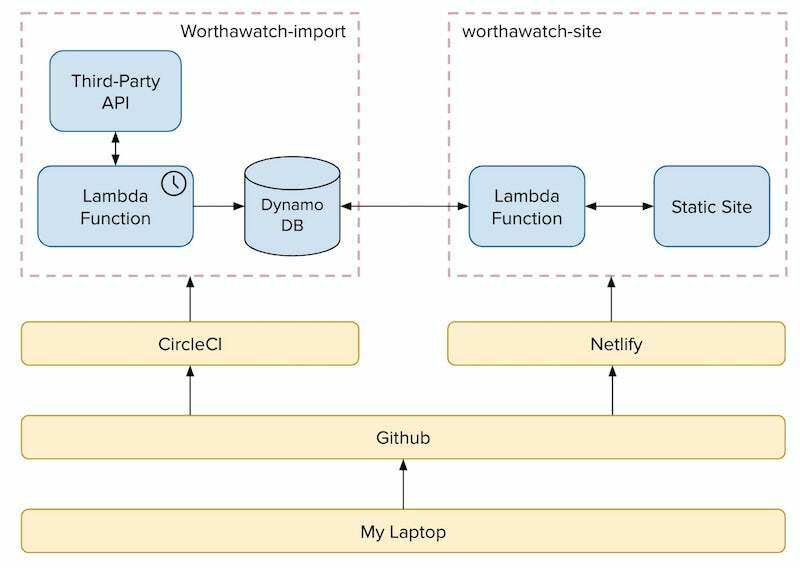 The import workflow is made up of a third Party API, a serverless function running on a cron and DynamoDB to store the API results. I split the import part out because I wanted to lean more heavily on the third party API and I knew it would mean I’d be rate limited at 10 requests per minute. I didn’t want users to have to wait a minute for the page to load. It didn’t make any sense to use Netlify to manage deployment of this serverless function and I already had it hosted in AWS so I chose to keep it there. I still wanted a way to build and deploy it that didn’t directly involve my laptop though. Enter CircleCI, a free Build and Deployment platform that again you can get set up with in minutes. I created an account and a CircleCI config file, and within 30mins of trial and error I had a workflow to deploy both master and branch builds to stage and prod environments. I needed a better way to manage API tokens now that the build wasn’t happening on my laptop. This turned out to be incredibly easy in the end because AWS has a service for providing just this: the Parameter Store. You can set secrets via the CLI, or via the AWS Console, and then fetch them using a really simple promise API with the aws-param-store npm package. I knew I was likely to be rate limited often so I wanted to be able to retry the request until it succeeded. This approach was possible because the requests were asynchronous to any actual user action. I was tempted to write this logic myself but ultimately there was no need as this fetch-retried npm package did just the trick. It backs off exponentially between retries until the request has been fulfilled. At this point we had a fully working system. The last remaining itch I wanted to scratch was token expiration. The API I was working with didn’t have a way to automate token renewals which meant that each month I had to remember to go to the UI and generate a new one. I decided that one thing I could do was send myself an email reminder just before it was about to expire. Accomplishing this with SES was again fairly straightforward just by following a few online guides. I created a new lambda which ran daily and calculated the remaining days left on the token. If it was close to expiring I sent an email using the SES library in the AWS-SDK npm package (my code). As everything was running in AWS I just had to grant my lambda function access to SES by extending the IAM role and updating my serverless.yml file. I essentially copy and pasted my way to a pretty robust architecture! I had rarely touched any of these tools before and was able to navigate them fairly easily by reading tutorials and blog posts. I was constantly impressed by how far along the tooling has come though, most of it was very user intuitive, and how quickly you can get a system up and running. What does this have to do with code review? The book is written for people in leadership positions but the lessons are universal. Fundamentally it’s about helping those around you be as successful as they can be. As developers we rarely exist in a silo so communication is one of the most important tools we have. I’ve seen a lack of empathy for someone else’s opinion cause serious rifts within a team and this happens more than ever during code review, usually as comments on Pull Requests. So let’s look at how we can apply Radical Candor to code review. It’s crass, it’s unconstructive. It was followed by the commenter rewriting the PR (without asking) to use a different templating language. It was also followed by the author of the original PR looking for a new job. This can transpire in lengthy PRs where someone only adds a single LGTM comment. Unless it’s been discussed offline it’s likely that the reviewer simply doesn’t care enough to invest their time in thoroughly reviewing the code. In this case their approval is both hollow and disrespectful. If you actually do come across a long PR with no faults whatsoever you should take the opportunity to offer some more constructive, positive feedback. In its worst form this can also be represented by a lack of a comment. The reviewer sees something they know is risky but they keep quiet, perhaps thinking that the author will learn their lesson when it causes them problems later on. You may be hitting this area if you try to sugarcoat some negative feedback for fear of hurting the feelings of the author. Pay attention to your use of “could”, “maybe”, “if you like”, “up to you”, particularly if your real feelings about it are stronger. This can also be an issue when re-reviewing code: if the author has improved their code in response to a number of your comments but it still doesn’t reach the standard it should be at. It’s possible you will look for ways to praise their improvements rather than make further direct feedback. 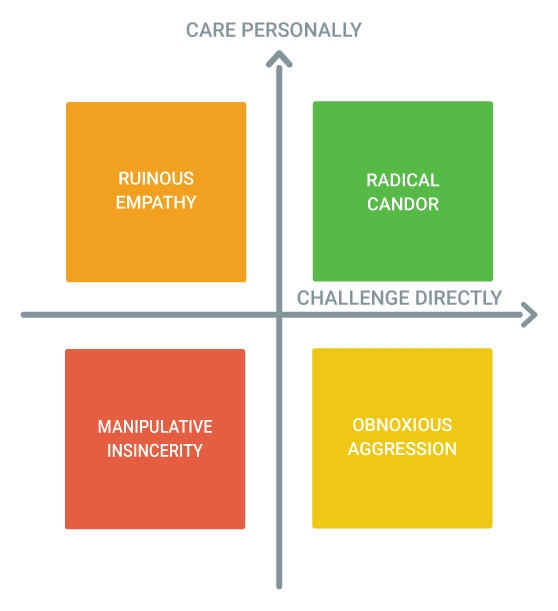 What does the radical candor version look like? Take time to acknowledge the good parts and comment if you learned something. This is something we often overlook because we become trained to simply spot defects. This is about explaining the “why”. What was it you experienced/read/told that gave you the different perspective? Share those resources. “I don’t like this pattern” vs “This pattern actually caused us issues in a previous project because of X”. Some people might be ok receiving feedback that borders on obnoxious aggression but they are likely to be in the minority. It can also be intimidating for others who see those comments. My natural tendency is to be over polite and hold back if I don’t know the author that well. Because of that, if I doubt myself I typically err on the side of saying something. You might want to consider erring on the side of holding back If your personality is the opposite. They’re the cockroaches of large sites: they outlast developers, framework apocalyses, full rewrites. You know that something outside of your code base relies on them and it’s near impossible to figure out what. It’s easier to just leave it where it is and move on with your life. * Alright, now we make a Proxy object. * At this point, all we're going to do is return the original value. And we’re done! We’ve written some code which does absolutely nothing! // log: Someone tried to access GLOBAL_CONFIG.env! Reloading the page might give you some idea of who is accessing the object but, given that the calling code is probably outside of your own code base, it’s only going to get you so far. Instead, let’s send that data somewhere! Your favourite analytics service will probably do the trick. And now we can delete the base_url property, safe in the knowledge that no one is using it. Destructuring and rest/spread parameters for Arrays is part of the es6 specification. Support for their use with Objects is, at the time of writing, a stage 2 proposal for future inclusion. Of course, you can use it today via a transpiler like Babel. Object Shorthand is already part of the es6 specification and with a combination of these three features you can start to use some patterns which can lead to more reliable, less error prone code. First, let’s dig in to how destructuring objects looks. We’ll take a simple config object and use destructuring to extract some values. Note that the original config object never mutates. The benefits of immutability are well documented and, whilst this isn’t strictly immutable, starting to write in a way which maintains the original values allows you to reason about the code more easily. Using those three dots creates a new object which represents everything that remains in the config after you have taken out the named variables. These are solid primitives which can be built up into useful patterns. One way in which they can help immediately is by removing connascence. Connascence relates to the relationship between two components where a change in one would require a change in the other to maintain functionality. A way in which this has often transpired in my code is with argument ordering in functions, particularly functions with high arity. Assuming that these functions are in different files, aside from the email address it’s pretty hard to tell from the call side what each parameter relates to. It also breaks if we get the order wrong. A way in which this is typically resolved is by switching to passing a single object as a parameter and naming the values within it. Now you no longer need to care about understanding their role or the order in which they’re included. Which means you can satisfy your OCD by ordering them alphabetically or in pyramid style. We no longer know what’s inside data and in a function that was more complex we’d probably have to resort to documenting the function arguments in a jsdoc fashion. This can be pretty useful anyway but we can remove the need for it to some extent by using destructuring (note the braces within the arguments list). Now the order of the arguments no longer matters and we understand what the values represent on both sides of the function contract. Which means we can go back to a more simple looking call, without any concern about order. At this point we’ve already made the code much more robust and resistant to errors whilst keeping the code very simple and readable. Another trick we have with these three features is to destructure within arguments themselves. In our example, we have the username and email in our original config object so let’s take them from there. Maybe that’s going a bit far… These are just tools for you to use however you see fit though. Hopefully this serves as an example of how you can use these new features to write safer, simpler code. There’s a lot of sytactic sugar in the new JS features but coupled together they achieve things which would be significantly harder, or at least more verbose, to write in ES5.